The Canada Reads finalist reflects on the true events that inspired her debut novel, The Boat People. 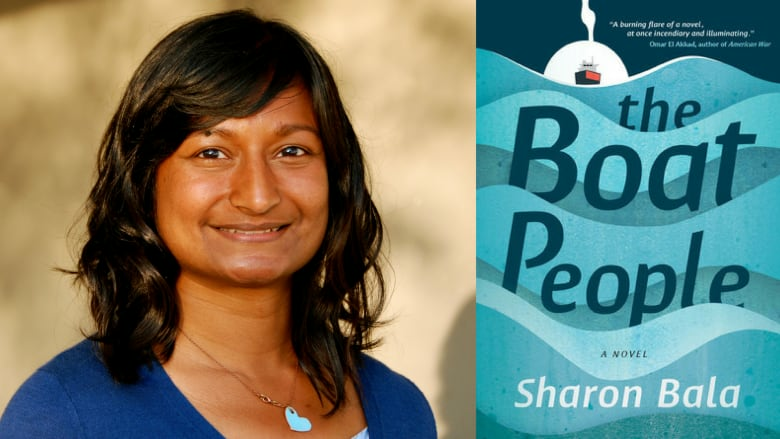 Sharon Bala's debut novel The Boat People had only been on shelves for a month when it was chosen by Mozhdah Jamalzadah for Canada Reads 2018. Told from the alternating points of view of a refugee, his lawyer and the woman charged with adjudicating his case, it's a nuanced look at what happens when 500 Tamil men, women and children survive a perilous ocean voyage to reach Canada's shores. The Boat People was a finalist for the 2018 Amazon.ca First Novel Award. Bala spoke with CBC Radio's On the Go about how she wrote The Boat People. "The Boat People is inspired by a real story of a real ship that arrived on the west coast of Canada in 2010 called the MV Sun Sea. That ship carried a group of Tamil refugees who were fleeing Sri Lanka at the end of the civil war. There wasn't much on the public record about its passengers, so I had to make up the story, at least in terms of the individual people. "The book mainly follows a young widower named Mahindan and his son. When they arrive in Canada, they think the hard part is behind them. They've survived civil war. They've survived a detention camp in Sri Lanka. And they think, 'This is it.' But that's not the case. Then there's Priya, who is a second-generation Tamil Canadian and Mahindan's lawyer. And the final narrator is Grace, who is a third-generation Japanese-Canadian and the adjudicator who has to decide what's going to happen to this man and his son. And part of Grace's story is her own family's history of her mother having been interned during the Second World War." "One of the things that's very sad about this whole story is that the refugee storyline is timely, and has been since I started writing the novel in 2013. But the idea of internment and all of the propaganda that went into making people believe that the Japanese were these villainous people in the 1940s — that's happening again now with Muslims. That's not at all what I was expecting when I was writing. I thought, this part of the story is about the past. But that's not entirely true." "I hope this book is eye-opening readers — as it was for me, researching the book — into how difficult it is to navigate the refugee system in this country. And I hope that it's an eyeopener into how government uses words like 'illegal' and 'criminal' and sometimes those words are just lies. They're not true at all. "The Sri Lankan civil war began with a rallying cry of 'Sinhala first! Sri Lanka for the Sinhalese!' Then, about a year ago when I was finishing the last draft of this novel, there was all this talk about 'America first!' If you think about what happened with Japanese Canadians and internment, a lot of that began with cartoons featuring Japanese people doing terrible things. Now, we look at those cartoons and we think, 'How ridiculous.' I hope that 75 years from now, people will look at the videos circling now on the internet, being retweeted by the American president, and they'll think, 'How ridiculous! How could people be so credulous?'" Sharon Bala's comments have been edited and condensed.